Cannabis Clinicians Colorado and Trust Pro Advocates, a non-profit referral network for retired elite athletes seeking medical guidance and support, have teamed up for an observational pilot research program on quality of life in retired professional athletes and cannabidiol aka CBD. CBD is a non-psychoactive cannabidiol derived from either hemp or hops. The study is focused on athletes who have played collision sports such as hockey or football professionally or at an elite level, such as ranked college teams, national teams, or Olympic teams. 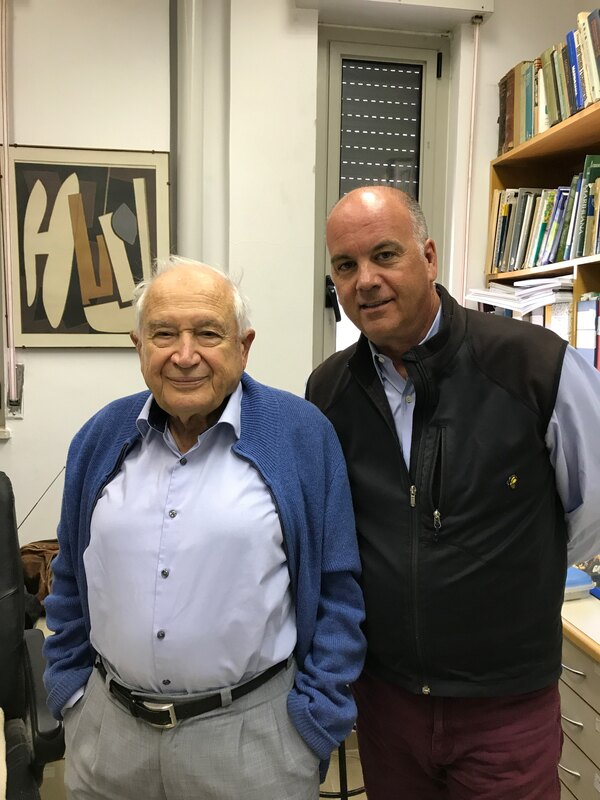 In October of 2017, Pat Karns, MA ATC of trustproadvocates.com traveled to Israel to discuss the pilot study with our friends Professor Raphael Mechoulam PhD and Inbal Sikorin RN. Here are Pat Karns and Dr Mechoulam last fall. Pat has worked extensively with Olympic and Professional athletes for over 30 years, including time as the Head Athletic Trainer for the Colorado Avalanche Hockey Team during their two Stanley Cup wins; the Minnesota NBA; and Olympic sports, including soccer, luge and ice hockey. Dr Mechoulam is, of course, the world’s foremost cannabis researcher, having first discovered THC in the 1960’s, elucidating the chemical structure of this and many other cannabinoids, as well as discovering the endocannabinoid system in the body. After discussing the nature, types, and severity of chronic medical issues frequently seen in retired athletes, Dr Mechoulam recommended three set doses of CBD for use in the pilot research program. Athletes will be assigned the doses randomly, or a placebo. The draft protocol is below. Are you an athlete retired from play? Do you live in or near the following cities? Registration will begin only after IRB approval. Protocol is subject to change until finalized and approved by our IRB. Study Overview: A placebo controlled study of cannabidiol (CBD) as a supplement to current therapies in retired elite level athletes. We plan to give a 60-day supply of either a measured-dose daily CBD supplement or a placebo to athletes with medical issues resulting from their competitive years. Athletes will undergo monitoring by WAVi EEG scan measurements, and Quality of Life assessment surveys including pain scores, sleep scores, and neuro-cognition tests during the study. 1. Look for evidence of correlation or lack thereof between a given dose of CBD as a supplement to other treatments and improvement or lack of disease progression in brain scan activity in retired athletes with medical issues. 2. Assess if a measured dose of CBD improves Quality of Life for retired athletes as measured by nueropsychology testing, scores for pain, anxiety, depression, self-care and mobility. Use of other drugs will also be recorded. 3. This is an uncontrolled, small population, short-term pilot study. If results are promising, we are planning a full 2 year study with a broader base of athletes. Prerequisites: Participants must be 21 years of age and not pregnant. Study subjects must have participated in either professional sports or professional-level amateur sports (such as Olympic, elite college, or national teams) for at least 1 year and one or more have medical issues resulting from this participation. Collision sports such as football and hockey will be given preference. This is an uncontrolled pilot study, so subjects are advised to continue other medications, treatments, and therapies as needed during the study, with the exception of other types of medical and or recreational marijuana. Methodology: 1. Study subjects will be interviewed by a medical professional or professional athletic trainer (know herein as the Clinician). A health history and athletic participation history will be taken. Quality of Life questions, including scores for pain, anxiety, depression, self-care and mobility, will be asked. Use of other therapies, treatments and drugs will be recorded. 2. Testing – WAVi EEG scans by clinicians in local areas closest to participants. 3. Neuropsychology testing: Brief Battery for Health Improvement, measure of physical pain, sleep quality, functional abilities, depression, and anxiety. Scores are normed against a community population sample and a chronic pain patient sample. Pittsburgh Sleep Quality Index cognition testing with CNS-Vital Signs highlighting attention, processing speed, verbal and nonverbal memory, and executive functioning. All three measures (BBHI 2, CNS VS, and PSQI) will be administered online. 4. Subjects are given a 2-week supply of either a high-quality, commercially available CBD oil or a placebo made of a flavored medium-chain triglyceride oil. Subjects will be given instructions for self-administering a set dose of cannabidiol twice daily. All labels will be standardized so neither the participant nor the Clinician knows if it’s a placebo or not. 5. Subjects follow-up with the Clinician every two weeks. Again, Quality of Life questions, including scores for pain, anxiety, depression, self-care and mobility, will be asked. Use of other therapies, treatments and drugs will be recorded. Subjects reporting adverse events or side-effects, such as drowsiness, may have dosages dropped or changed to a single dose at bedtime. Subjects reporting no effect or a positive enough effect that they wish to take more may have dosage increased. 6. WAVi EEG scans repeated with clinicians. Neuropsychology tests are repeated online. All tests conducted every four weeks for a total of three times per subject. 7. Product phase ends after 8 weeks. Discharge visit at 90 day mark repeats WAVi EEG and Quality of Life surveys to see if any effects have lasted past active supplementation. All participants receive a gift of branded samples of all products used in study, including products they did not take. Follow-up: Subjects will receive follow-up care for any adverse events for an additional 30 days.